The main difference between emu and ostrich is that the emu is the second largest bird in the world native to Australia whereas the ostrich is the largest bird in the world native to Africa. Furthermore, emu has deep brown color feathers while male ostrich has black color feathers and female ostrich has brown color feathers. Emu and ostrich are the two largest flightless birds in the world. Both have long necks, large eyes, long and strong legs. Emu is the second largest bird in the world, native to Australia. It can grow up to 4-6 feet in height. Also, it avoids living in thick forests as well as populated areas. Both male and female emu look similar as they have the same dense-brown plumage. However, during the breeding season, female emus develop black color feathers and blue patches on their head. The most significant feature of emu during reproduction is that it produces breeding couples. Each female lay around 20 eggs incubated by the male up to 56 days. Males do not eat and drink throughout the period they incubate the eggs. After hatching, males take care of the chick for 5-6 months. Emus are grown in farms to produce oil. In addition, they are used to produce meat and leather. Generally, emus are friendly with humans but, they attack other livestock. Ostrich is the largest bird in the world, native to Africa. It can grow up to 7-9 feet in height. Moreover, ostriches can run faster than horses and they are considered the fastest, two-leg runners on the earth. Furthermore, ostriches live in the savannas and arid regions. Male and female ostriches vary with the color of the plumage. Males have white-tipped black feathers. Females have grayish-brown plumage. Also, males grow larger in size. During mating, ostriches form groups where each male can mate with 6-7 females. The females lay around 40 eggs into the same nest. Females incubate the eggs during the day while male ostrich incubate them at night. The father teaches the chicks how to hunt and escape from predators. People grow ostriches for their feathers, which are used to produce decorative items and dusters. Generally, ostriches are more aggressive and can bite with their beaks while lashing out with their legs. Emu and Ostrich are the two largest birds in the world. Both are ratites that belong to the infraclass Palaeognathae. Both are flightless due to the presence of a flat breastbone without a keel, which makes them unable to fly. Also, both have long necks and long and strong legs designed for running. Their eyes are large. Moreover, both are omnivores and feed on different types of fruit, seeds, grass, and insects. Besides, their males incubate the eggs and take care of the chicks. Both are kept in farms for various uses including meat and leather. Emu refers to a large, flightless, fast-running, Australian bird, resembling the ostrich, with shaggy grey or brown plumage, bare blue skin on the head and neck, and three-toed feet while ostrich refers to a flightless, swift-running, African bird with a long neck, long legs, and two toes on each foot. 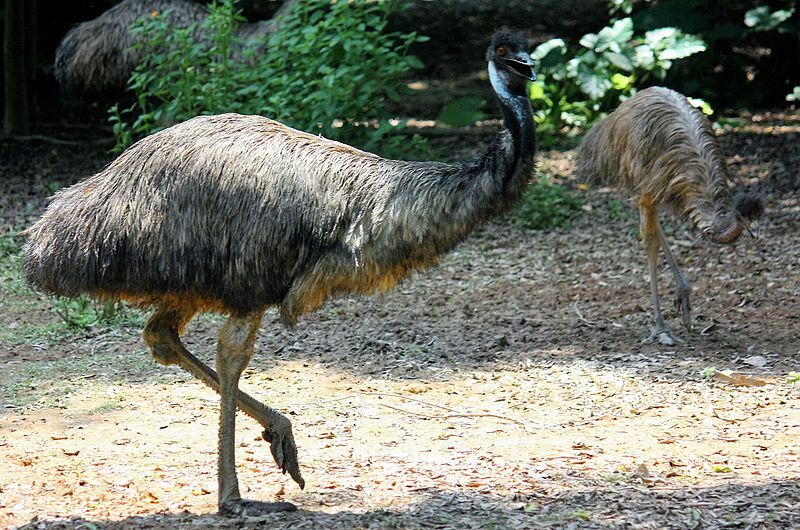 Moreover, emu is the second largest bird in the world while ostrich is the largest, living bird. A difference between emu and ostrich is that the emu grows up to 1.8 m in length while the male ostrich grows up to 2.8 m.
Another difference between emu and ostrich is their weight. Emu can grow up to 40 kg while ostrich can grow up to 120 kg. Furthermore, an interesting difference between emu and ostrich is that the emus carry their head below the level of their body while the ostriches walk with their head held above their body level. Difference between their male and female counterpart contributes to another difference between emu and ostrich. Both male and female emu has brown color plumage. 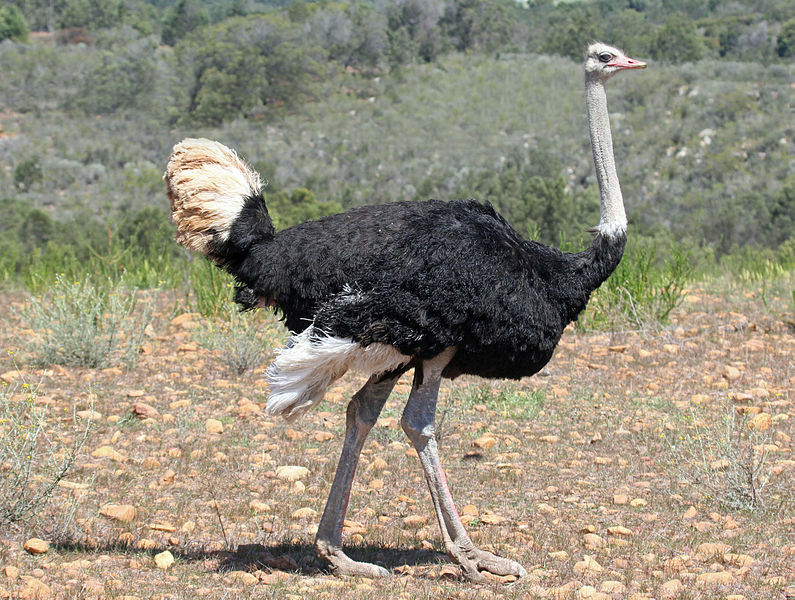 But, the male ostrich has black color plumage with white feathers on the wings and tail while the female ostrich has gray-brownish color plumage. An easily distinguishable difference between emu and ostrich is that the emu has three toes while ostrich has two toes. Besides, the running speed of an emu is 30 miles per hour while the running speed of an ostrich is 40 miles per hour. Also, there is a difference between emu and ostrich in their mating pattern as well. Emu forms mating couples while a male ostrich mates with 6-7 females. Emu produces 1-1.5 pounds large, greenish-blue color eggs while ostrich produces the largest eggs in the world, which are 3 pounds large and white in color. Emu is friendly while ostrich is more aggressive. Emu is native to Australia while ostrich is native to Africa. Therefore, nativity also accounts to a difference between emu and ostrich. In addition, emu inhabits sclerophyll forests and wooded savannas that provide plenty of open space while ostrich inhabits savannas and semi-deserts. Lifespan is another big difference between emu and ostrich. Emu can live up to 10-20 years while ostrich can live up to 40-50 years. Emu is the second largest bird in the world that is native to Australia. It has brown color feathers. On the other hand, ostrich is the largest bird in the world native to Africa. Both emu and ostrich cannot fly and they have long and strong legs for running. The main difference between emu and ostrich is the size and the geographical location.